The biggest amphitheater in the world was transformed into a small model inside Miniatur Wunderland – and it is still a truly impressive masterpiece. It took 23 months to create this work of art from about 3,000 pieces. All this time we spent drawing, sanding, milling, gluing and dabbing with all we had, to create this little version of this imposing amphitheater. What came out was a crop version of the Colosseum with a horizontal scale of 1:130 and a vertical scale of 1:100. As soon as the small Preiser figurines start inhabiting the model, it really comes to life. Just like in real life numerous groups of tourists and students are wandering throughout the iconic remains whilst some individual monks are secretly excavating pieces of wall to take away. A little known fact is, that St. Peter's Basilica was partly constructed from rocks taken from the outer rings of the Colosseum. Our technicians have come up with a creative idea regarding the lighting. The illumination of the front of the building is controlled by our visitors’ body temperature. A freezing person will make the light turn blue, whereas the hot blooded spectator will wash the front in a reddish hue. All in all the building is illuminated by an impressive installation of light. Ever since 1999 the original Colosseum has become a memorial as to the wrongness of death penalty. Whenever the death penalty is suspended somewhere or has been abolished by a nation, the original building will be awash with light for 48 hours. 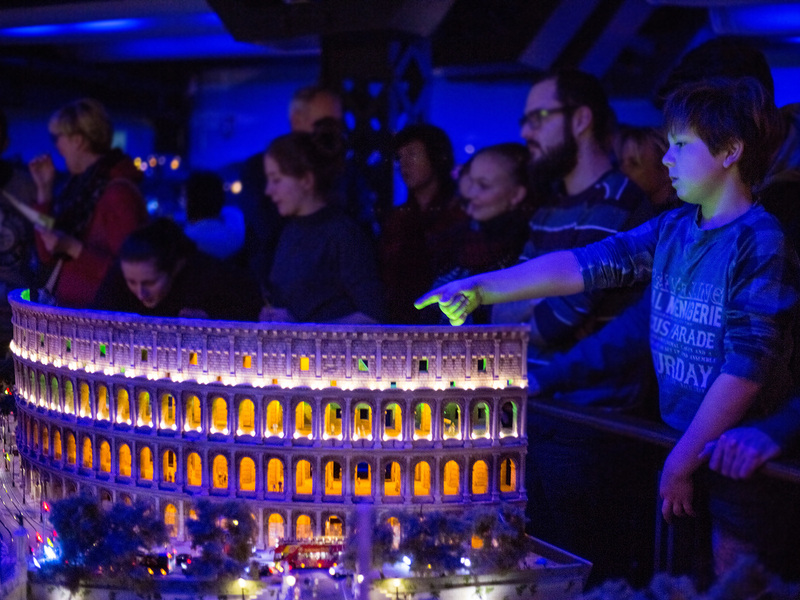 This installation is also part of the Wunderland version of the Colosseum and shines brightly every night. When it comes to the aspect of model building, the Roman landmark, alongside St. Peter's Basilica, is currently one of the most elaborate buildings of all times.